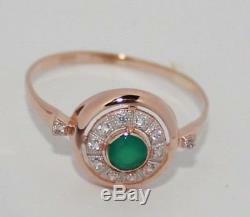 Adorable ring russian USSR jewelry Rose Gold 14K 585 2.16g S-18,0 31318. Ring in Rose gold 585. BEFORE YOU OFFER PLEASE ASK ALL QUESTIONS. This is a unique Russian item! You'll never see something similar to your friends, relatives or others! As usual, 2 weeks, and you like your precious! Look at my other stuff. The item "Adorable ring russian USSR jewelry Rose Gold 14K 585 2.16g S-18,0 31318" is in sale since Sunday, March 25, 2018. This item is in the category "Jewelry & Watches\Vintage & Antique Jewelry\Fine\Retro, Vintage 1930s-1980s\Rings". karolana" and is located in ASTRAKHAN, default. This item can be shipped worldwide.